The TAA Airline began with an un-pressurised DC-3, VH-AES, Hawdon. The first TAA service took three hours five minutes to fly from Laverton Air Force Base near Melbourne to Sydney, on September 9, 1946, with 21 passengers on board. Essendon Airport was closed at the time. TAA knew that to be a leader in aviation in Australia, it was vital to ensure that it had the latest and best aircraft, so that it would attract patronage. In 1946 John Watkins, Engineering Manager, began researching the marketplace and ultimately selected the American Consolidated Vultee Convair 240, for TAA. The Consolidated Convair 240, joined the TAA fleet in September 1948, making TAA the first overseas airline to introduce the Convair pressurized airliner to domestic operations in Australia. The Convair being a pressurised aircraft raised the stakes in passenger comfort, with larger cabin capacity, improved environmental control, and improved performance with increased speed. The Convair was an immediate success, flying mainly on the East Coast between capital cities, replacing the DC3 and DC4 aircraft, and cutting flying times, which of course was an incentive for the business community. TAA was the first airline to be given a licence to operate the aircraft with an all up weight of 40,500 lbs. TAA introduced the first turbine powered airliner to Australia, the Vickers Viscount, which entered service December 1954. The Vickers Viscount 720 introduced the next level of technological change, into the Australian aviation scene. 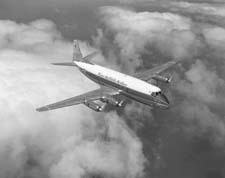 The Vickers Viscount had a reputation for smoothness in flight and the ability to again reduce flying times between the major cities. It provided the ability to vastly improve in-cabin services facilities, permitting 3 course meals to be served inflight, travelled at higher altiltudes, brought improved passenger comfort, improved reliability and in October 1955 'Tourist class' air travel was introduced to Australia. TAA was the first airline outside Europe to purchase and use Viscounts and this allowed for increasing passenger capacity whilst reducing fares and and baggage limitations. The inevitable technological change change in aircraft design saw in June 1959, TAA introduce the Lockheed Electra Mk2 Aircraft. The Electra was an 84 seater aircraft, which flew faster, had the ability to carry more passengers, and flight times were again reduced. To keep up with these newer aircraft, procedures were revised to suit. TAA also introduced the FOKKER F27 'Friendship" in the late 1950's, as TAA sought a replacement for its now aging DC3 fleet. FOKKER of Holland was developing a high wing turbine aircraft that could be fitted with the same engines as those fitted to the Viscount. In March the following year Fokker Friendships entered service in Australia. Along with the Fokker Friendship came the upgraded Vickers Viscount Super 816 series aircraft, with a seating capacity of 64. This now gave TAA the 'youngest' fleet in Australia and with growing patronage, requiring inflight staff numbers to be increased as the airline was growing rapidly since the intoduction of 'Tourist' class in 1955.